1987-1991　B.S in Agronomy, Shandong Agricultural University, Taian, China. 1991-1994 M.S. in Plant Genetics and Breeding, Shandong Agricultural University, Taian, China. 1996-1999　Ph.D. in Plant Genetics, Institute of Genetics, Chinese Academy of Sciences, Beijing, China. 1994-1996　Lecture, Department of Agronomy, Shandong Agricultural University, Taian, China. 1999-2003　Research Associate, MSU-DOE Plant Research Laboratory, Michigan State University, East, Lansing, MI, USA. Wound-inducible defensive proteinase inhibitors (PIs) in tomato (Solanum lycopersicum L.) provide an ideal model to investigate the mechanism of systemic defense signaling. Among the proposed intercellular signals are systemin, an 18-amino-acid peptide that is produced from its precursor protein called prosystemin, and the fatty acid-derived plant hormone jasmonic acid (JA). 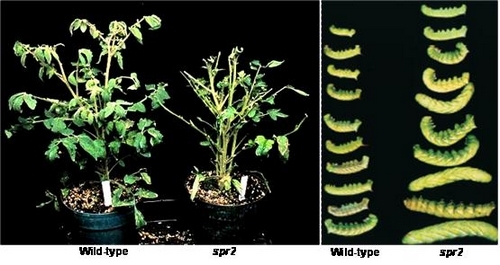 Transgenic tomato plants over-expressing the PROSYSTEMIN gene driven by the 35S promoter (35S:PS) show constant expression of JA-inducible PIs and other defensive genes. In order to dissect the systemin/JA-mediated defense signaling pathway using a genetic approach, we identified a collection of spr (suppressor of prosystemin-mediated response) mutants which are defective in wound-induced defense gene expression. Interestingly, map-based cloning of these mutants identified genes that are involved in JA biosynthesis and signaling. Grafting experiments using a JA biosynthesis mutant spr2 and a JA receptor mutant (jai1) demonstrated that JA, rather than systemin, is the long-distance mobile "wound signal" for systemic defense responses. We aim to identify most, if not all, of the genes that are involved in systemin/JA-mediated wound response pathway and elucidate how these genes are regulated. A long-term goal of our research is to develop an environmentally friendly strategy to crop protection. The International Tomato Genome Sequencing Project (SOL) was begun in 2004 by an international consortium including participants from 10 countries. In the SOL project we are responsible for sequencing of the tomato chromosome 3. The initial approach was to sequence the euchromatic sequence using a BAC-by-BAC approach. In 2009, a whole-genome shotgun approach was initiated, which in conjunction with other data yielded high quality assemblies. Tomato as a Solanaceae reference genome will be an invaluable resource in addressing two fundamental biological questions: first, how genomes code for extensive phenotypic differences using relatively conserved sets of genes; and second, how phenotypic diversity can be harnessed for the improvement of agricultural products. Plant growth and defense response are coordinated by several phytohormones including jasmonate and auxin. We use Arabidopsis root as a model systemin to study the molecular mechanism underlying jasmonate/auxin interplays. 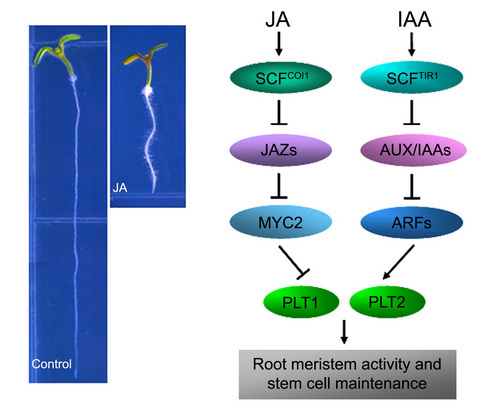 By using multiple molecular genetic approaches we have been able to identify several molecular components by which jasmonate regulate auxin biosynthesis, signaling and transport during postembryonic root growth. We expect that these studies will ultimately enable us an integrated view of plant growth and defense. Zhai Q and Li C* (2019). The plant Mediator complex and its role in jasmonate signaling. Journal of Experimental Botany. (In press). Zhang X，Zhou W, Chen Q, Fang M, Zheng S, Ben S and Li C*. (2018). The Mediator subunit MED31 is required for radial patterning of Arabidopsis roots. Proc. Natl. Acad. Sci. USA. 115, E5624-E5633. Zhang R, Ge S, He J, Li S, Hao Y, Du H, Liu Z, Cheng R, Feng Y-Q, Xiong L, Li C, Hetherington A, and Liang, Y-K.* BIG regulates stomatal immunity and jasmonate production in Arabidopsis. New Phytologist. doi: 10.1111/nph.15568. 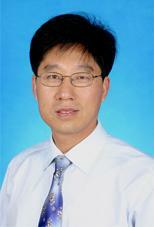 An C, Li L, Zhai Q*, You Y, Deng L, Wu F, Chen R, Jiang H, Wang H, Chen Q, Li C*. (2018).Mediator subunit MED25 links the jasmonate receptor to transcriptionally active chromatin. Proc. Natl. Acad. Sci. USA. 114 (42), E8930-E8939. Du M, Zhao J*, Tzeng D, Liu Y, Deng L, Yang T, Zhai Q, Wu F, Huang Z, Zhou M, Wang Q, Chen Q, Zhong S, Li C-B and Li C*. (2017). MYC2 orchestrates a hierarchical transcriptional cascade that regulates jasmonate-mediated plant immunity in tomato. The Plant Cell. 29, 1883-1906. Li J, Li C and Smith S.M. (Eds.). (2017). Hormone Metabolism and Signaling in Plants. Woodhead Publishing, Elsevier. Zhai Q, Yan C, Li L, Xie D and Li, C*. (2017). Jasmonates. In Hormone Metabolism and Signaling in Plants. 1st ed. Li J, Li C and Smith M.S. ed (London, United Kingdom: ELSEVIER Academic Press), pp. 243-263. Li C*, Li J*, Harter K, Lee Y, Leung J, Martinoia E, Matsuoka M, Offringa R, Qu L, Schroeder J and Zhao Y. (2016). Toward a molecular understanding of plant hormone actions. Molecular Plant.9, 1–3. Xu Y, Jin W, Li N, Zhang W, Liu C, Li C* and Li Y*. (2016). UBIQUITIN-SPECIFIC PROTEASE14 interacts with ULTRAVIOLET-B INSENSITIVE4 to regulate endoreduplication and cell and organ growth in Arabidopsis. The Plant Cell. 28, 1200-1214. Ito J, Fukaki H, Onoda M, Li L, Li C, Tasaka M and Furutani M*. (2016). Auxin-dependent compositional change in Mediator in ARF7- and ARF19-mediated transcription. Proc. Natl. Acad. Sci. USA. 113(23), 6562-6567. Ou Y, Lu X, Zi Q, Xun Q, Zhang J, Wu Y, Shi H, Wei Z, Zhao B, Zhang X, He K, Gou X, Li C and Li J. (2016).RGF1 INSENSITIVE 1 to 5, a group of LRR receptor-like kinases, are essential for the perception of root meristem growth factor 1 in Arabidopsis thaliana.Cell Research. 26(6), 686-698. Zhai Q, Zhang X, Wu F, Feng H, Deng L, Xu L, Zhang M, Wang Q* and Li C*. (2015).Transcriptional mechanism of jasmonate receptor COI1-mediated delay of flowering time in Arabidopsis. The Plant Cell.27, 2814-2828. Chen Q , Liu Y, Maere S, Lee E, Van Isterdael G, Xie Z, Xuan W, Lucas J, Vassileva V, Kitakura S, Marhavy P, Wabnik K, Geldner N, Benkova E, Le J, Fukaki H, Grotewold E, Li C, Friml J, Sack F, Beeckman T* and Vanneste S*.(2015). A coherent transcriptional feed-forward motif controls auxin-sensitive PIN3 expression for lateral root development. Nature Communications. 6, 8821. Li C*. (2015) Toward understanding the stem-cell origin and the molecular regulation of rice tillering. Journal of Genetics and Genomics. 42, 47-48. Zhou Z, Wu Y, Yang Y, Du M, Zhang X, Guo Y, Li C and Zhou J*. (2015). An Arabidopsis plasma membrane proton ATPase modulates JA signaling and is exploited by the Pseudomonas syringae effector protein AvrB for stomatal invasion. The Plant Cell. 27, 2032-2041. Wang Z, Mao J, Zhao Y, Li C and Xiang C*. (2015). L-Cysteine inhibits root elongationthrough auxin/PLETHORA and SCR/SHR pathway in Arabidopsis thaliana. J. Integr. Plant Biol. 57, 186–197. Yu C, Sun C, Shen C, Wang S, Liu F, Liu Y, Chen Y, Li C, Qian Q, Aryal B, Geisler M, Jiang D and Qi Y*.(2015). The auxin transporter, OsAUX1, is involved in primary root and root hair elongation and in Cd stress responses in rice (Oryzasativa L.). The Plant Journal. 83, 818-830. Du M, Zhai Q, Deng L, Li S, Li H, Yan L, Zhuo Huang Z, Wang B, Jiang H, Huang T, Li C-B, Wei J, Kang K, Li J and Li C*. (2014). Closely-related NAC transcription factors of tomato differentially regulate stomatal closure and re-opening during pathogen attack. The Plant Cell.26, 3167-3184. Song S, Huang H, Gao H, Wang J, Wu D, Liu X, Yang S, Zhai Q, Li C, Qi T and Xie D. (2014). Interaction of MYC2 with EIN3 modulates antagonism between jasmonate and ethylene signaling. The Plant Cell. 26, 263-279. Du L, Li N, Chen L, Xu Y, Li Y, Zhang Y, Li C and Li Y. (2014). The ubiquitin receptor DA1 controls seed size by modulating the stability of the ubiquitin-specific protease UBP15/SOD2 in Arabidopsis. The Plant Cell. 26, 665-677. Xu Y, Zhang S, Guo H, Wang S, Xu L, Li C, Qian Q, Chen F, Geisler M, Qi Y, Jiang D.(2014). OsABCB14 functions in auxin transport and iron homeostasis in rice (Oryza sativa.L). The Plant Journal.79, 106-117. Wang S, Xu Y, Li Z, Zhang S, Li C, Qian Q, Jiang D, Qi Y. (2014). OsMOGS is required for N-glycan formation and auxin-mediated root development in rice. The Plant Journal.78, 632-645. Kang J, Yu H, Tian C, Zhou W, Li C, Jiao Y, Liu D. (2014). Suppression of photosynthetic gene expression in roots is required for sustained root growth under phosphate deficiency. Plant Physiology.165, 1156-1170. Zhang G, Li S, Wang L, Ye W, Zeng D, Rao Y, Peng Y, Hu J, Yang Y, Xu J, Ren D, Gao Z, Zhu L, Dong G, Hu X, Yan M, Guo L, Li C and Qian Q. (2014). LSCHL4 from japonica cultivar, which is allelic to NAL1, increases yield of indica super rice 93-11. Molecular Plant.7, 1350-1364. Song Y, Ye M, Li C, He X, Zhu, Wang R, Su Y, Luo S and Zeng R. (2014). Hijacking common mycorrhizal networksfor herbivore-induced defence signaltransfer between tomato plants. Scientific Reports. 4, 3915. Yan L, Zhai Q, Wei J, Li S, Wang B, Huang T, Du M, Sun J, Kang L, Li C-B and Li C*. (2013). Role of tomato lipoxygenase D in wound-induced jasmonate biosynthesis and plant immunity to insect herbivores. PLoS Genetics. 9, e1003964. Yu X, Pasternak T, Eiblmeier M, Ditengou F, Kochersperger P, Sun J, Wang H, Rennenberg H, Teale W, Paponov I, Zhou W, Li C, Li X, and Palme K. (2013). Plastid-localized GR2-controlled glutathione redox status is essential for Arabidopsis root apical meristem maintenance. The Plant Cell.25, 4451-4468. Sun J, Qi L, Li, Y, Zhai Q and Li C*. (2013). PIF4 and PIF5 link blue light and auxin to regulate the phototropic response in Arabidopsis. The Plant Cell. 25, 2102-2114. Zhai Q, Yan L,Tan D, Chen R, Sun J, Gao L, Dong M-Q, WangY and Li C*.(2013). Phosphorylation-coupled proteolysis of the transcription factor MYC2 is important for jasmonate-signaled plant immunity. PLoS Genetics. 9, e1003422. Li S, Zhao B, Yuan D, Duan M, Qian Q, Tang L, Wang B, Liu X, Zhang J, Wang J, Sun J, Liu Z, Feng Y, Yuan L and Li C*. (2013). The rice zinc finger protein DST enhances grain production through controlling Gn1a/OsCKX2 expression. Proc. Natl. Acad. Sci. USA.110, 3167-3172. Wang C, Yan X, Chen Q, Jiang N, Fu W, Ma B, Liu J, Li C, Bednarek S, and Pan J. (2013).Clathrin light chains regulate clathrin-mediated trafficking, auxin signaling, and development in Arabidopsis. The Plant Cell. 25, 499-516. Wei J, Yan L, Ren Q, Li C, Ge F, and Kang L. (2013). Antagonism between herbivore-induced plant volatiles and trichomes affects tritrophic interactions. Plant Cell Environment.36, 315-327. Chen R, Jiang H, Li L,Zhai Q, Qi L, Zhou W, Liu X,Li H, Zheng W, Sun J and Li C*. (2012). TheArabidopsis Mediator subunit MED25 differentially regulates jasmonate and ABA signalings through interacting with MYC2 and ABI5. The Plant Cell.24, 2898-2916. Ren J, Li C-B and Li C*. (2012). Tomato genome gets fully decoded--Paves way to tastier and healthier fruits. J. Genetics & Genomics.39,303-305. Qi L, Yan J, Li Y, Jiang H, Sun J, Chen Q, Li H, Chu J, Yan C, Sun X, Yu Y, Li C-B and Li C*. (2012). Arabidopsis plants differentially modulate auxin biosynthesis and transport during defense responses to the necrotrophic pathogen Alternaria brassicicola.New Phytologist. 195, 872-882. LiuX, Li F, Tang J, Wang W, Zhang F, Wang G, Chu J, Yan C, Wang T, Chu C, and LiC*.(2012). Activation of the jasmonic acid pathway by depletion of the hydroperoxide lyase OsHPL3 reveals crosstalk between the HPL and AOS branches of the oxylipin pathway in rice.PLoS One.7, e50089. Guo H, Kang L,Li C, Ren Q, Sun Y, Wang C, and Ge F. (2012). Elevated CO2 reduces the resistance and tolerance of tomato plants to Helicoverpa armigera by suppressing the JA signaling pathway. PLoS One. 7, e41426. Liu L, Wei J, Zhang M, Zhang L, Li C and Wang Q. (2012). Ethylene independent induction of lycopene biosynthesis intomato fruits by jasmonates.Journal of Experimental Botany. 53, 5751-5761. Chen M, Liu H, Kong J, Yang Y, Zhang N, Li R, Yue J, Huang J, Li C, Cheung A, and Tao L. (2011).RopGEF7 regulates PLETHORA-dependent maintenance of the root stem cell niche in Arabidopsis. The Plant Cell.23, 2880-2894. Li H, Jiang H, Bu Q, Zhao Q, Sun J, Xie Q and Li C*. (2011). The Arabidopsis RING finger E3 ligase RHA2b acts additively with RHA2a in regulating ABA signaling and drought response. Plant Physiology.156, 550-563. Sun J, Jiang H and Li C*. (2011). Systemin/jasmonate-mediated systemic defense signaling in tomato. Molecular Plant. 4, 607-615. Zhang L, Jia C, Liu L, Zhang Z, Li C and Wang Q. (2011). The involvement of jasmonates and ethylene in Alternaria alternata f. sp. lycopersici toxin-induced tomato cell death. Journal of Experimental Botany. 62, 5405-5418. Sun Y, Yin J, Cao H, Li C, Kang L and Ge F. (2011). Elevated CO2 influences nematode-induced defenseresponses of tomato genotypes differing in the JApathway. PLoS One. 6, e19751. Zhou W, Wei L, Xu J, Zhai Q, Jiang H, Chen R, Chen Q, Sun J, Chu J, Zhu L, Liu C-M andLi C*.(2010). Arabidopsis tyrosylprotein sulfotransferase Attpst acts in the auxin/PLETHORA pathway in regulating post-embryonic maintenance of root stem cell niche.The Plant Cell.22, 3692-3709. Wei J, Wang L, Zhao J, Li C, Ge F and Kang L. (2010). Ecological trade-offs between jasmonic acid-dependent direct and indirect plant defences in tritrophic interactions. New Phytologist.189, 557-567. Li C*and Li J. (2010). Toward understanding the molecular mechanisms governing plant hormone actions: A brief introduction to the Major Research Program “Molecular mechanisms of plant hormone actions” funded by the National Natural Science Foundation of China (NSFC). Chinese Science Bulletin. 55, 2197. Liu F, Jiang H, Ye S, Chen W-P, Liang W, Xu Y, Sun B, Sun J, Wang Q, Cohen JD and Li C*. (2010). The Arabidopsis P450 protein CYP82C2 modulates jasmonate-induced root growth inhibition, defense gene expression and indole glucosinolate biosynthesis. Cell Research.20, 539-552. Sun J,Xu Y, Ye S, Jiang H, Chen Q, Liu F,Zhou W, Chen R, Li X, Tietz O, Wu X, Cohen J,Palme K and Li C*. (2009). ArabidopsisASA1 is important for jasmonate-mediated regulation of auxin biosynthesis and transport during lateral root formation.The Plant Cell.21, 1495-1511. Mueller LA et al., (2009). 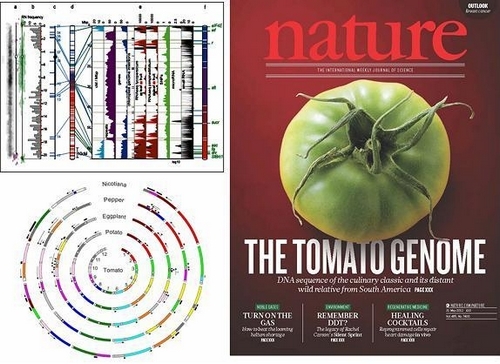 A snapshot of the emerging tomato genome sequence. The Plant Genome. 2, 78-92. Jiang H, Li H, Bu Q and Li C*. (2009). The RHA2a-interacting proteins ANAC019 and ANAC055 may play a dual role in regulating ABA response and jasmonate response. Plant Signaling & Behavior. 4, 464-466. Bu Q, Li H, Zhao Q, Jiang H, Zhai Q, Zhang J, Wu X, Sun J, Xie Q, Wang D and Li C*.(2009). The Arabidopsis RING finger E3 ligase RHA2a is a novel positive regulator of ABA signaling during seed germination and early seedling development. Plant Physiology.150, 463-481. Liang W, Li C-B, Liu F, Jiang H, Li S, Sun J, Wu X and Li C*. (2009). The Arabidopsis homologs of CCR4-associated factor 1 exhibit mRNA deadenylation activity and play a role in plant defense responses. Cell Research.19, 307-316. Li C-B, Zhao J, Jiang H, Geng Y, Dai Y, Fan H, Zhang D, Chen J, Lu F, Shi J, Sun S, Chen J, Yan X, Lu C, Chen M, Cheng Z, Ling H, Wang Y, Xue Y and Li C*.(2008). A snapshot of the Chinese SOL Project. Journal of Genomics and Genetics. 35, 387-390. Qi J, Qian Q, Bu Q, Li S, Chen Q, Sun J, Liang W, Zhou Y, Chu C, Li X, Ren F, Palme K, Zhao B, Chen J, Chen M and Li C*.(2008). Mutation of the rice NARROW LEAF1 gene, which encodes a novel protein, affects vein patterning and polar auxin transport. Plant Physiology.147, 1947-1959. Bu Q, Jiang H, Li C-B, Zhai Q, Zhang J, Wu X, Sun J, Xie Q and Li C*. (2008). Role of the Arabidopsis thaliana NAC transcription factors ANAC019 and ANAC055 in regulating jasmonic acid-signaled defense responses. Cell Research. 18, 756-767. Li H, Sun J, Xu Y, Jiang H, Wu X and Li C*. (2007). The bHLH-type transcription factor AtAIB positively regulates ABA response in Arabidopsis. Plant Molecular Biology. 65, 655-665. Sun J, Jiang H, Xu Y, Li H, Wu X, Xie Q and Li C*. (2007). The CCCH-type zinc finger proteins AtSZF1 and AtSZF2 regulate salt stress responses in Arabidopsis. Plant & Cell Physiology. 48, 1148-1158. Zhai Q, Li C-B, Zheng W, Wu X, Zhao J, Zhou G, Jiang H, Sun J, Lou Y and Li C*. (2007). Phytochrome chromophore deficiency leads to overproduction of jasmonic acid and elevated expression of jasmonate-responsive genes in Arabidopsis. Plant & Cell Physiology. 48, 1061-1071. Zheng W, Zhai Q, Sun J, Li C-B, Zhang L, Li H, Zhang X, Li S, Xu Y, Jiang H, Wu X and Li C*. (2006). Bestatin, an inhibitor of aminopeptidases, provides a chemical genetics approach to dissect jasmonate signaling in Arabidopsis. Plant Physiology. 141, 1400-1413. Li C-B, Zhao J, Jiang H, Wu X, Sun J, Zhang C, Wang , Lou Y and Li C*. (2006). The wound-response mutant suppressor of prosystemin-mediated responses6 (spr6) is a weak allele of the tomato homolog of CORONATINE-INSENSITIVE1 (COI1). Plant & Cell Physiology.47, 653-663. Li C-B, Sun J, Jiang H, Wu X and Li C*. (2006). Systemic defense signaling in tomato. Chinese Science Bulletin.50, 1817-1822. Canoles MA, Beaudry RM, Li Cand Howe GA. (2006). Deficiency of linolenic acid in lefad7 mutant tomato changes the volatile profile and sensory perception of disrupted leaf and fruit tissue.J. Amer. Soc. Hort. Sci. 131, 284-289. Mueller LA, Tanksley SD, Giovannoni JJ, van Eck J, Stack S, Choi D, Kim BD, Chen M, Cheng Z, Li C, Ling H, Xue Y, Seymour G, Bishop G, Bryan G, Sharma R, Khurana J, Tyagi A, Chattopadhyay D, Singh NK, Stiekema W, Lindhout P, Jesse T, Lankhorst RK, Bouzayen M, Shibata,D, Tabata S, Granell A, Botella MA, Giuliano G, Frusciante L, Causse M and Zamir D. (2005). The Tomato Sequencing Project, the first cornerstone of the International Solanaceae Project (SOL). Comparative and Functional Genomics. 6, 153-158. Li C, Schilmiller AL, Liu G, Lee GI, Jayanty S, Sageman C, Vrebalov J, Giovannoni JJ, Yagi K, Kobayashi Y and Howe GA. (2005). Role of β-oxidation in jasmonate biosynthesis and systemic wound signaling in tomato. The Plant Cell. 17, 971-986. Li C, Liu G, Xu C, Lee G, Bauer P, Ganal M, Ling H and Howe GA. (2003). The tomato Suppressor of prosystemin-mediatedresponse2 gene encodes a fatty acid desaturase required for the biosynthesis of jasmonic acid and the production of a systemic wound signal for defense gene expression. The Plant Cell.15, 1646-1661. Li C, Williams MM, Loh Y-T, Lee GI and Howe GA. (2002). Resistance of cultivated tomato to cell content-feeding herbivores is regulated by the octadecanoid-signaling pathway. Plant Physiology. 130, 494-503. Li L, Li CandHowe GA.(2001). Genetic analysis of wound signaling in tomato: evidence for a dual role of jasmonic acid in defense and female fertility. Plant Physiology. 127, 1414-1417.